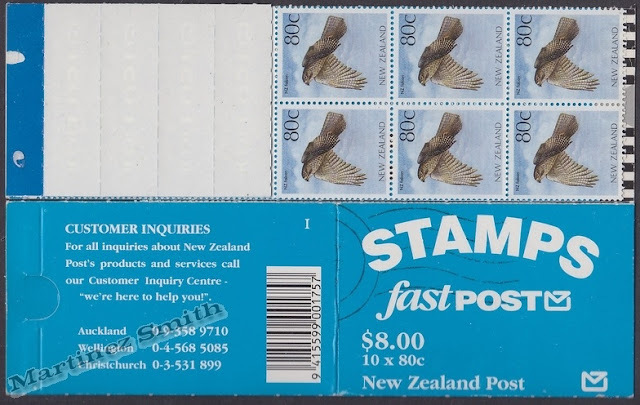 Virtual New Zealand Stamps: 1993 Fastpost Booklet. This issue relates to and could be considered part of the 1985 - 93 Bird Definitives. In fact, it was included in our post on that issue. 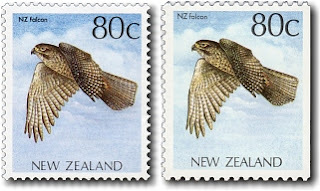 In 1993 there was a reissue of the 80c value, this time depicting the New Zealand Falcon. 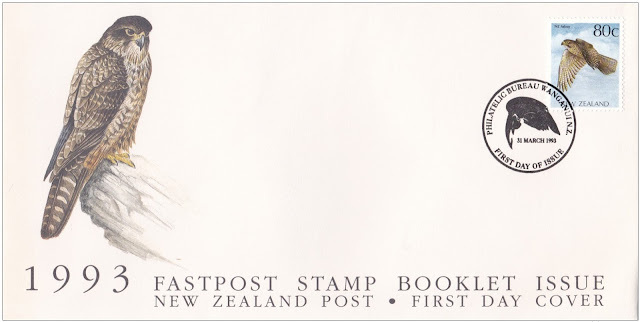 The purpose of this issue was booklets for Fastpost. The original Perf 14½ x 14 issued in 1993 was reissued in 1994 as a perf 12 variety. This variety was found only in booklet formats. In 1995 another second variety appeared where one side of the stamp was imperforate on either the left or right sides - whichever edge was closest to the edge of the booklet. This should not be considered a flaw as it was intended to be issued like this which is why I have called it the second variety. First Day Covers were not issued for either of these two varieties. The New Zealand falcon or bush hawk (Falco novaeseelandiae) is one of two species of true birds of prey native to New Zealand. Becoming increasingly rare in the North Island, it is still seen only in isolated back-country valleys and in the South Island high country. It is a versatile hunter and fast flier, reaching speeds of up to two hundred kilometres per hour. Its prey consists mainly of smaller birds, mice, rabbits and an occasional stoat. The falcon was once a target for farmers - perhaps because of the bird's fierce defence of its breeding territory, which will lead it to attack even human trespassers. Today, the New Zealand falcon is no longer hunted and is protected by law. First Day Cover - 31 March 1993. The booklet of 10 x 80c stamps.